Welcome to the baby goose photo tour! 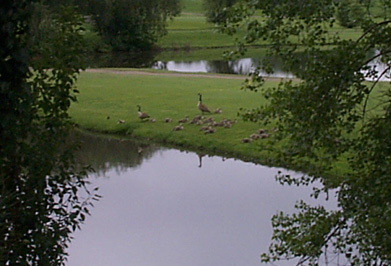 In the spring of 2000 we noticed a huge family of geese. There seemed to be about 30 babies and only 2 adults. Is it even possible for a single pair to have this many babies? Especially because the babies were so close in size - that would be unexpected if the eggs were laid over a period of time. Curious about the gigantic family, we hunted them down and shot pictures.